AlphaSmart has unveiled Dana, a portable device larger than a handheld and less expensive than a laptop, intended for students. Powered by Palm OS 4.1, Dana includes a full-size, integrated keyboard and a 560 by 160 pixel touch screen that is roughly 7.5 by 2.25 inches. It has 8 MB of memory and two SD/MMC slots. It costs $399 and is available now from the Palm Store. The backlit, monochrome screen is 3.5 times wider than what's on the typical Palm OS handheld. The screen image can be rotated horizontally and vertically, 90 degrees so it is both a 160 by 560 and 560 by 160 pixel screen. HandEra helped AlphaSmart develop this larger screen. It comes with a rechargeable battery and an AC adapter. It can also run off three AA batteries. AlphaSmart rates the battery at 30 hours, off of a single charge. Dana weighs two pounds. It is 12.4 inches wide, 9.3 inches deep and 1.9 inches thick. It is made of strong ABS polycarbonate plastic and has been designed to survive being mistreated. It has an infrared port and two USB ones and can be HotSynced like any other Palm OS model. Dana comes with the standard Palm applications that have been resized for Dana's wide screen. It also comes with AlphaWord, a word processor with spell-checker and thesaurus that is compatible with Microsoft Word file format. This has been licensed from BlueNomad. It also comes with PrintBoy from Bachmann Software, which provides direct printing from AlphaWord to IR or USB printers. Also bundled with Dana is QuickOffice from Cutting Edge Software, which has a word processor and spreadsheet. These are special versions capable of using the screen in either its extra wide or extra tall configurations. "The introduction of AlphaSmart's Dana shows the potential for innovation with Palm OS," said David Nagel, chief executive officer of PalmSource. "The versatility of Palm OS, combined with AlphaSmart's education expertise, has enabled this breakthrough product that meets specific needs of the education market." Thanks to Ryan B. and Craig G. for the tip! Warning: If you run in front of my car...you'll get tired. If you run behind my car...you'll get exhausted. I'm guessing you have to flip the device on its side manually to make use of the screen rotation. You probably saw it like this. What is breakthrough about this? First Palm OS device out of a PDA form factor (I know symbol and others have rugged versions etc.)... that said it looks lame. owned: Pilot 5000, PalmPilot Pro, Palm V, IIIc, m505, Sony T615. It is the first Palm OS device, in a laptop-like form factor, with a full size keyboard, large screen and 30 hour battery life aimed at the education market. Mr. Nagle's quote is marketing speak, but this is a first for the Palm OS. Not even sure it's the first PalmOS device out of a PDA format. Don't know about you or other people, but I'd much rather have a PDA and then an external keyboard like the stowaway. These full keyboard units keep failing. Psion effectively went out of the PDA business and Microsoft has left the Handheld PCs to industrial devices. Is there a difference between an industrial device and a device intended for high school students? I think the high schoool student would give the device more punishment - despite the fact the industrial devices would be in harsher conditions. At this price I think it needs color and a higher res vertically (at least 320 like my tiny Clie). If this is the same EdH of Pocket PC Thoughts and PDA Buzz fame, it wouldn't bother with what he says. He's a one man propaganda machine for Microsoft. Let's hope he trolls somewhere else. Uh huh. And with a handle like Treo007, you aren't biased at all are you? Perhaps you could clue me in as to how this is a breakthrough product? Is this a breakthrough product? Of all the previous attempts to market these devices one element was severely lacking. All the way back to the original Radio Shack TR Model 100 to the last Alphasmarts they have lacked on very needed feature that this one has. I know this market quite well, as I have wanted one of these for like forever. I have owned only one of them the Brother PowerNote and it was a model with only 16k storage space. It turned out to be useless for this reason. Fortunately, I did not spend anything on it. I got it hand-me-down from my brother and nephew who both used it but gave up, as it lacked some crucial features. The Laser PC7, QuickPad, Seiko WPS word processor notepad, and others had good battery life, useful screens, and eventually just barely enough memory for useful work. But by the time they were made useful, they were too close in price to used laptops. So, what does this model add that is a breakthrough? Software. Expansion was available for some of the earlier models, but what could you put in it? A few spell chekcer cards or other simple stuff. But no software like this Dana has out of the barrel. Even the Windows CE units that were in some cases attractive (The Jornada clamshell model...what was it called 820? and the Clio was fascinating with that swing screen deal) had no software to add. The CEs had powerful enough software built, but to bring up painful memories.....My opinion of CE was that it was just too buggy to trust with any real work. This Dana has all the features that made the previous AlphaSmarts profitable for the company. (I learned from one of their own people on the PDABUzz site that they have actually been selling similar models to schools for years. They have sold 2 million or so. That is certainly far more than total CE models of this sort sold. I would say that the market offers far better value with a Clie (or for the true bargain driven, a Clemente) with a Stowaway. But, I wish this Dana well and it does have this key breakthough feature; 10,000 add on programs. My daughter brought one of these sorts of type pads home last year. They use them for take-home special assignments. I wonder what happens the first time one comes back to school with "The Palma Sutra" installed on it! And, I guess I should say, that I think this model has only a 50/50 chance of succeeding at making the Palm OS software and the AlaphaSmart hardware successful in a new market. The used laptops, the PDAs with Stowaways, and just plain desktops almost everywhere you might need one could keep them from going anywhere. And, I don't see EdH's remarks as trolling. He is more than welcome to have an opinion here. All of us would expect the same welcome at PocketPCThoughts and we would hope not to get discounted just because we are Palm OS users. I DON'T think it's necessarily a breakthrough product (at least not at this price), that's not the point. It doesn't mean you should be listened to at face value however (we should all consider the source). For the record, I read a few weeks back a post from the site admin at PPC Thoughts telling Palm OS (or at least "device agnostic") posters to go "troll" somewhere else. So no, you probably wouldn't get the same level of respect over there that you would here. Regardless, I don't care if he posts here. Just those that don't know what he's up to should be made aware. Not much of a breakthrough -- it looks very similar to a device from Cambridge Computer released in 1988 called the Z88 (link to a nice ad here: http://www.nvg.org/sinclair/computers/z88/images/z88ad1_jpg.jpg). I used this a lot at school, and found it very handy (though some of the teachers at the time were a bit dubious) -- it had a mammouth 256k memory, was expandable and had backup storage via EPROM (that had to be wiped using UV Light -- this was in the days before Flash ROM!). 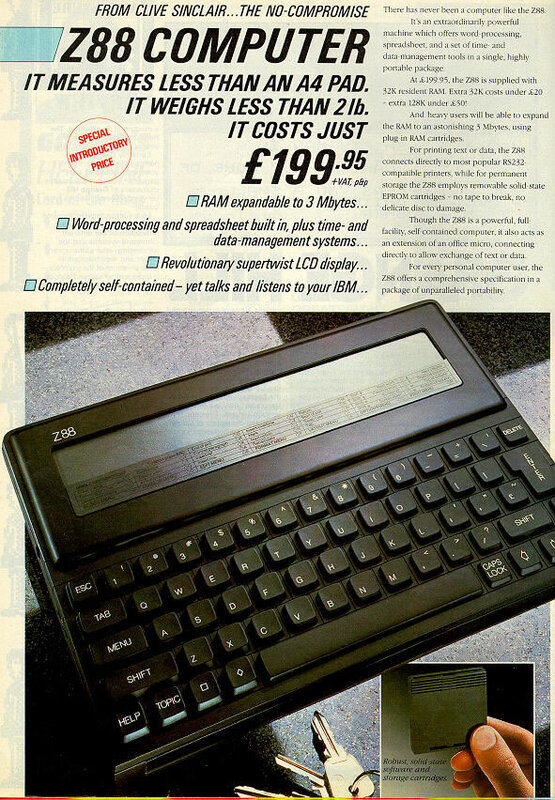 It also had a built in wordprocessor/spreadsheet/database, communications software (VT52 emulation too! ); and BASIC. There was also a thriving community writing software for it (sort of CP/M based I seem to remember). As I said, as a student it was very useful. But, this was in the days before colour laptops, PDAs, and indeed affordable laptops (from the ad you will see it costs ~$300, a laptop would cost you around $5000-6000). Things have moved on. Students are wealthier, more tech aware, and most importantly, require stylish technological solutions (one only has to look at the penetration of Nokia mobile phones amongst students and the young to observe this behaviour). The Dana's main drawback is it is plain ugly -- it looks just like an industrial unit, not out of place stock taking in a warehouse or somewhere. Students will not want something that does not have the 'wow' factor. For those interested in EdH's sordid history...He's a Microsoft MVP. He likes to stir things up on PocketPCThoughts quite frequently by posting FUD about Palm, but if you try to argue any of the points in a reasonable manner, Jason gets upset and asks you to "troll" somewhere else. Should he be allowed to post here? Of course. But don't fool yourself into thinking that he's "just another PDA user." Since I don't really want to spend any more time on this site talking about another site, this will be my last comment on it. But yes, the situation Scott described is EXACTLY what I've seen go on at Pocket PC Thoughts. The level of FUD and the subsequent reactions (particularly on the part of the site admins) to those that logically point it out is so irrational that you've got to think that the entire thing is planned (or Jason Dunn and Co. really are that stupid). It's as if they're fighting some kind of battle on behalf of Microsoft. So it makes perfect sense that that is exactly what EdH (a site admin at Pocket PC Thoughts) is here to do. "I know this market quite well, as I have wanted one of these for like forever. " but that's funny because you didn't mention the apple emate, quite possibly the best attempt at a notebook PDA, because it was small and relatively lightweight, but not as tiny as the clamshell EPOC and WinCE devices, as well as having a very nice 16-level grayscale 320x480 backlit screen and the ability to communicate easily with macs and PCs alike. it also came with some pretty nice word processing and spreadsheet software. If you're seriously looking for a notebook PDA for composition purposes, you should seriously look on ebay or the http://www.thisoldnewt.com swap meet pages for an emate. it'd be worth it. RE: EdH. Yeah, I was one of those told to cool it at PocketPCThoughts. How odd that was. EdH post that the NX70V is not even competitive with a two year old Casio PPC. Then we discuss it. Then all of a sudden Jason bust in and accuses us of a flame war? That was odd. I chalked it up to Jason working too hard on the new site design and not much else. Anyway, I see a little less Palm bashing there since then, and I have tried to let a lot more of it go without comment there, since that appears to be what Jason wants. That's life. I should perhaps have mentioned the EMate. It has perhaps the happiest users of any of these devices except the RS Model 100 (those guys are religiously devoted. There are vanity sites all over the Net dedicated to the Model 100.) EMate was funky looking, too. "Don't know about you or other people, but I'd much rather have a PDA and then an external keyboard like the stowaway. These full keyboard units keep failing. Psion effectively went out of the PDA business and Microsoft has left the Handheld PCs to industrial devices." I use both a HandEra 330 with an external Palm Portable Keyboard, as well as an AlphaSmart 3000, which is from the same family of products as the Dana. I've enjoyed using the HE-PPK combination, but after hearing about the Dana, I realise the Dana is the next step up for me after the HE-PPK. The HE-PPK works best on a flat surface, whereas the AlphaSmart (and the Dana, too) is literally a laptop - you could perch it on your lap and type without worrying about it falling over, etc. As for the comment "These full keyboard units keep failing", that's a bit unfair on a new product, and a bit too early to say. Whilst not wanting to move too far off topic, PocketPCThoughts seems to be run under an iron fist. Dissention with official Microsoft policy is rarely tolerated, and any views that run against the web site's 'management' are usually removed - and replaced with a small note saying that they have been removed. Having said that - it is a good source of information, and it is always interesting to keep an eye on the views and thoughts of the opposition. I've been using the Alphasmart for over a year now and I love it. It is merely a word processor, but it is great for taking notes at meetings and writing at Starbucks or other places. Not great for editing. It is limited. Some of its advantages are that it is light (2 lb), great battery life (4 AA. . .500+ hours and I still have the same batteries that I started with), and cheap ($200). I teach at a local college and several of my students have also purchased it. I type much faster than I write. I decided to try out the Dana. This is what I like about the Dana: light weight (2 lb), uses OS operating system (unlimited programs), larger screen (good for editing), font support, easy to synch to desktop, etc. Now why would someone want a Dana over a laptop. My major reason is WEIGHT (2 lb). I hate lugging the 6.5 lb laptop around even though I like the color screen, all the applications, power, etc. I do feel the Dana is a bit pricey $400 (8 meg), no modem. When you start adding cards and modems, it can get expensive. However, for now, I love what it does. SIZE and WEIGHT is everything to me. I might add that I also own a desktop and a laptop. Why not get a REAL Computer for a mere $150 more? You can get a NEW DELL Dimension 2300 with warranty, 1.8GHZ, 128MB RAM, 30GB HD, 56K Modem, WinXP, and 15" Color Monitor for $549. $399 for Dana is a joke. RE: Why not get a REAL Computer for a mere $150 more? It’s kind of hard to put a dimension 2300 in your backpack and carry it to school. The 2300 is a deferent kind of product for a different market. "WARNING - HOLE IN FLOOR ABOVE DOORWAY BELOW." It might not be fair to compare a rugged two-pound "laptop" to a desktop. Maybe a better comparison would be some of the used laptops on the market. That does make $399 seem awfully steep given the extremely limited capabilities of the Dana. $199 might be fair. Because it would cost thousands of dollars more in maintenance and repairs. I myself would buy the Dell, but it's designed to be sitting on a desk or your knees, or in a padded case for protection. A school would need to provide power outlets for each student, an I.T. technician for maintenance and updates, a shop area for repairs and software reloads, and a good relationship with their shipping company to deal with returns/exchanges resulting from breakage. These are students, and if the going got rough, the Dell would be needing service before the Dana needed its first recharge. An Audrey for $1.25 anyone? You'll take the Dana over the "REAL Computer" desktop Dell if you have to put it in a backpack and carry it to school everyday (and needing it to work during your exams after surviving a drop onto the pavement). A cheap notebook computer is the nearest equivalen; and a lightweight one is almost 3 times as expensive new. That's a really dumb comparison. You could also compare it to my 20 year old Atari, but....well, it's just a pointless comparision. Being a student myself, in junior high, I personally know that are school is uses and is happy with previous AlphaSmarts. Let me put it this way, are school doesn't have enough room to make practical use of a 'real' computers for every student. This is a great bridge between a Palm and a laptop. This is definitely not aimed at the general audience. Also $150 times 100 is just a mere $15,000 more. You must understand that schools have limited budgets and limited room. Going on that basis ... im sure you went out and bought a PDA for about the same price. Why would anyone pay that much instead of just getting a desktop computer? THE FORM FACTOR NUMBNUTS. Lightweight notebooks cost more than the heavy ones because of the size. Why the heck do you think there is such a large market for laptops and notebooks when they cost twice as much as a desktop machine! Why? Because there are thousands of people smarter than you with that stupid comparison. The laptop/notebook market is HUGE. And every single one of them are a heck of alot more than $399. I work in an environment where I have to monitor and keep up a Unix network. I use a Sharp Zaurus because it has all of the networking tools I need to perform network intrusion, detection and administration via SSH. My Sony Clie T615 is great for its small form factor ... and I AM GLAD I bought both of them with a price value of over $600 combined over a $400 desktop PC because I would hate to lug my desktop around the building. And when I lug my $400 PC to another room, im going to have to crawl under a desk to plug the dang thing in ... do some monitoring and edit a spreadsheet or two ... then lug it to the next room doing the WHOLE THING OVER AGAIN. GIVE ME A BREAK. Mark my words - I will be proven right when this POS soon ends up on eBay selling for $1.25 right next to the Audrey. How would the Dana failing prove that the Dell is better? Maybe someone would already have a Clie NR70V like me and not need a Dana. OR someone could have a T615C and Zaurus and not need a Dana. The Dell is not competition with the Dana any more than a Ford Pickup competes with a Mazda Miata at construction sites. It is not pointless. My POINT is that any school administrator who buys Danas rather than real PCs given the small price differential relative to the ENORMOUS differential in overall computing power should be immediately FIRED. I look at "BANG FOR THE BUCK" and the Dana at $399 ain't no bang for the buck! If I had children in school, I would want them to have a modern, fully-functional PC at school - not some crappy oh-so-limited-in-function device like this Dana. The bottom line POINT is - a full PC based at school at almost the same price is better than this $399 glorified address book/calculator. The kids with the PC's will be so much more ahead of kids with this POS. There is no small price differential. Even the cheapest decent PC for school use would cost twice as much, and that's not including the huge system administration and maintenance costs. Add in limited classroom space, which makes laptops a better but less reliable solution, plus system administration and maintenance and you're probably talking 6x the cost or more. >"huge (PC) system administration and maintenance costs"
This is a MYTH created by IT Departments in order to increase their budgets, staff, and importance/power within their specific organization. It's all BS. > staff, and importance/power within their specific organization. It's all BS. Schools don't have IT departments, barely a budget to buy computers, and any so called IT staff is typically one or two people for a whole school district.